This glorious chopped salad is like a fiesta in a bowl—flavorful, colorful and ready to enjoy in just 10 minutes! 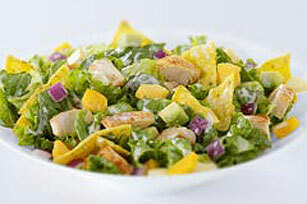 Toss greens with all remaining ingredients except dressing. Save 70 calories and 10 grams of fat per serving by preparing with KRAFT Lite Ranch Dressing and KRAFT 2% Milk Shredded Reduced Fat Colby & Monterey Jack Cheese. Serve with a whole wheat dinner roll and CRYSTAL LIGHT Pink Lemonade. Look for avocados that are either slightly soft or firm. Small light-brown markings on the peels are normal and won't affect the quality of the fruit inside. If mashing the avocados for recipe use, look for softer avocados. If needing sliced avocados, or if not using immediately, select firmer pieces of fruit. Avocados will continue to ripen after being picked. To ripen, place in paper bag and let stand at room temperature until desired softness. Ripe avocados can be stored in the refrigerator for several days.